Half the time ingredients are not available here, but still excellent inspiration. The uppercase abbreviations are reminders of where the recipe is, like OL=Olive magazine or BM=bookmark, for Nigel Slater’s baked pumpkin and spiced chickpeas recipe – which looks amazing. I have not found lemongrass and lime, so I might try a ras el hanout variation for the chickpeas instead. We shall see. Tonight is definitely fiskeboller med hvit saus, Norwegian tinned fish balls in white sauce, served with boiled potatoes and raw grated carrots. And a sprinkling of curry powder! Very retro, but that is a well-travelled tin that is not going on a third housemove. One could make fiskeboller from scratch, but the tinned ones are normally used. Wash the potatoes and boil under done, 20-30 minutes. Make white sauce: melt the butter on low heat, add flour and stir well. It will look fry. Pour in stock drained from the tin of fiskeboller, a bit at a time, keep stirring until it is smooth. Add milk and bring to slow boil for a few minutes, so it thickens. Season the sauce with salt, pepper and nutmeg (taste it!). Add more milk if the sauce is too thick, and stir well so it does not burn. Carefully add the fiskeboller to the sauce and heat gently so they are warm through before serving. Serve with boiled potatoes, raw grated carrot and a sprinkle of curry powder on the fiskeboller and potatoes. Note: Wonderful lighting, and such a photogenic dish! Leftovers now packed for three lunches, and two of us had dinner with this. In the TINE recipe the carrots are boiled, but I like them grated raw with this. PS The coffee pod note at the end of the list above is because I really miss my morning cappuccino, normally magically appearing bedside at 0615, but the barista (my husband) is currently a continent away. The French press is in a box somewhere. Coffee capsules are not ideal, but I am contemplating getting a coffee pod machine for the weekends…. if coffee capsules can be found outside the Nespresso shop at Marina Mall. Still looking. Has anyone tried the refillable coffee capsules? Less waste would be good. This entry was posted in food and tagged fish, living in Accra, meal planning, Norwegian on January 25, 2018 by krumkaker. We had three nights in São Tomé town (as I managed to book two nights at Makaira Lodge before realizing that is on the other island, Principe – whoops. Better planning next time). Nicer to be out of town, but it was interesting to see the town, and easy to do daytrips out. The town is a bit rundown, but cleaner than Accra (no open sewers, less plastic garbage) and there is a lovely waterfront. Old buildings, faded colours, and such nice people. Of course we went to the market: vegetables, fresh fish, used clothing, plantains and bananas. São Tomé imports a lot of its food, but the local produce looked nice. What we were looking for: peixe fumado, smoked fish. We’d had a delicious feijoada for lunch one day, bean stew but with smoked fish rather than smoked pork, and we had three Norwegians coming for dinner once we were back in Accra. So we wandered round the market looking for smoked fish: super friendly people, lots of fresh vegetables, no tourists. We found dried fish, and the dried fish seller took us over the smoked fish lady. I do not speak Portuguese, so was trying to explain in terrible Spanish/Italian/French that we needed enough for five people: we bought seven pieces in the end, to have a bit extra, and it was really nice quality. The lady on the next stall was drinking palm wine, which looks a bit milky, and she really wanted us to have a taste. Obrigada, no, I said, but was thrilled to have found good fish. Then we went to a cafe and drank some Sumol, ice cold Portuguese soda (pineapple, orange or passionfuit) which was wonderful. It did get get hot wandering around town. We also went to Pico Mocambo, a rum bar recommended by a friend, for a glass of cocoa rum on ice. Not well signposted (Google Maps saved us) but well worth a visit. We were wandering around on 1 May, most places were closed so this was a nice break. Definitely worth a visit: TAP flies Lisbon- São Tomé via Accra 3x a week, and direct from Lisbon once a week. Very friendly, nice place to visit and we experienced no begging (another nice change from Accra). I wish I spoke a bit of Portuguese, but we managed. Beaches and plantations, wonderful fresh fish (Papa Figo, 5 Sentidos, Mucumbli) and very relaxing. Green and lush, sea breezes and quiet. Bring cash, there were long lines at the ATMs, and foreign cards did not always work. We brought USD and euros, and 100 USD changed to dobras (2.5 million dobras) was plenty in local currency. Many places have prices in euros and dobras. I got my visa online, many countries do not need one. Grilled barracuda for lunch at Papa Figo. Wonderful! Leve-leve, they say on São Tomé: easy easy. It was a great weekend. 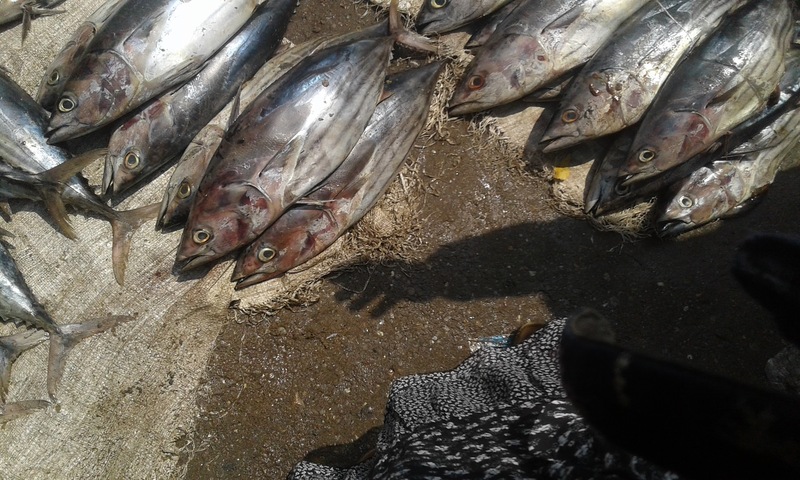 This entry was posted in travel and tagged fish, Sao Tome on May 8, 2017 by krumkaker. 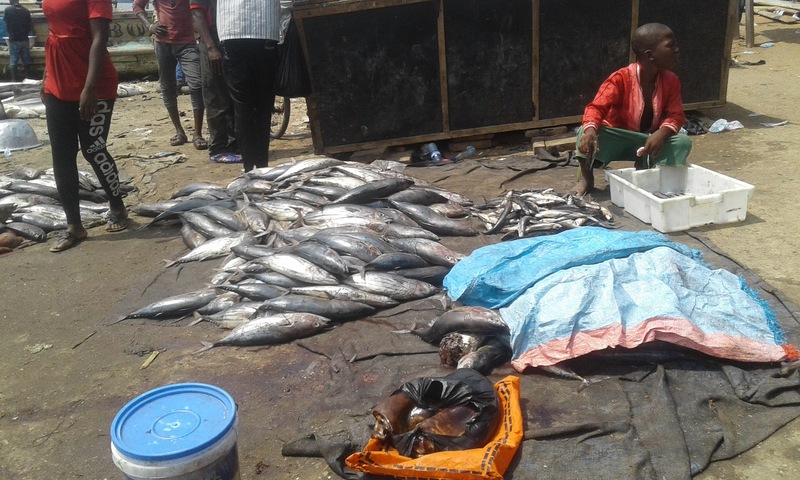 Yesterday we went to Tema, near Accra where there is a large fish market. 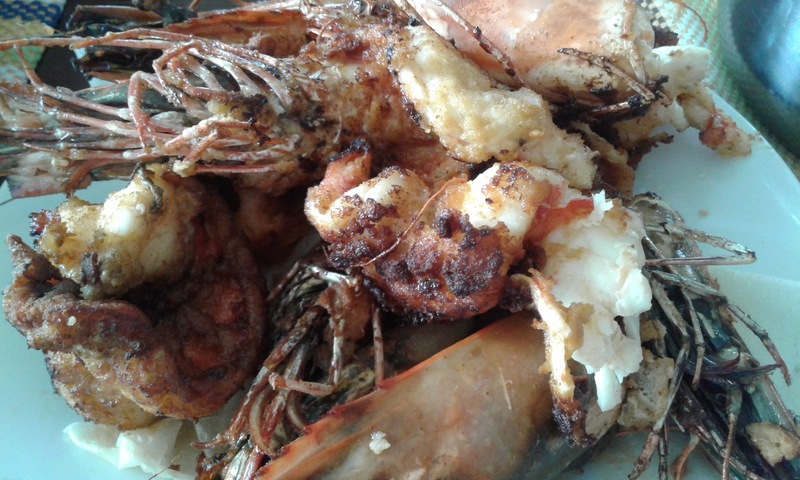 Goal: find large prawns for Sunday lunch. Quite the the experience. Lots of fish, of various shapes and sizes. Four of us went, and it was interesting. Some fish in bowls or baskets, some on sacks, some looking fresh and some else so. Eels, mackerel, red snapper, even some sharks at the water’s edge. All available to be bargained for. Much less hassling than I expected. The harbour was full of wooden fishing boats with flags, I had no idea most boats used were so small here. They were building fishing boats as well there. And there were some random chickens with chicks even there, pecking among the scraps. THESE are the prawns I was looking for! These were 50 cedi a kilo. Plus some calamaretti – next post, 15 cedi a kilo. Hard to know what the right price is, but these do look very nice. 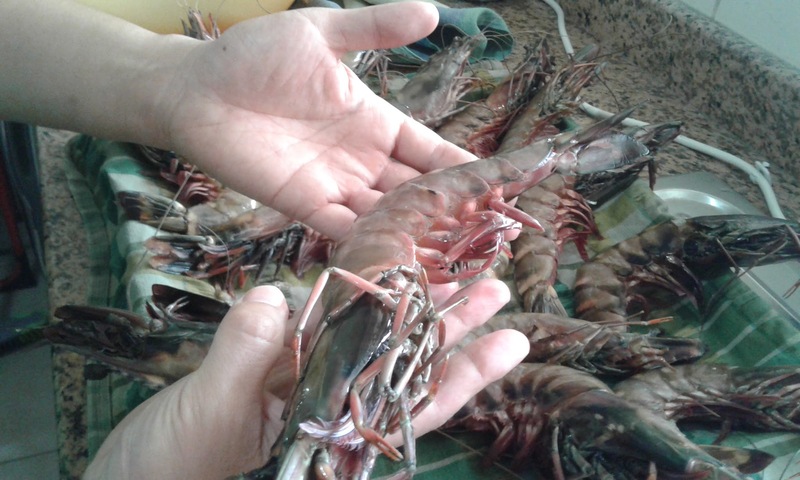 We cleaned them all here this morning, cutting out the intestinal tract and de-shelling them, Quite an exercise compared to small Norwegian shrimp. 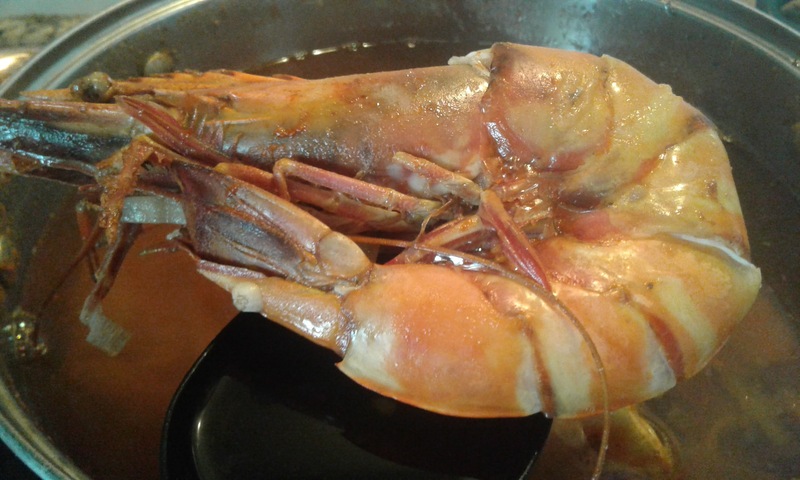 The prawns are currently in the kitchen, waiting to be cooked. Some have just been boiled with onion and garlic, under directions from our Egyptian neighbour. Some have been dipped in egg and breadcrumbs, ready to be fried downstairs. Then we’ll go to the Canadian neighbours and have lunch there. This is a nice part of compound living! UPDATE: and here they are, cooked for lunch. Very nice!! I also made calamaretti in umido (small calamari in tomato stew) and we made deep-fried calamaretti as well, all lovely. But with half of our group out sick, including my poor husband (just a bad cold, he is in bed listening to English football), there is still food left. I think I’ll make prawn risotto with the leftover stock tomorrow. This entry was posted in food, Ghana, travel and tagged fish, living in Accra on August 14, 2016 by krumkaker.